Home / Posts / News / Hands-On with the Skullgirls. Hur, Hur, Hur. 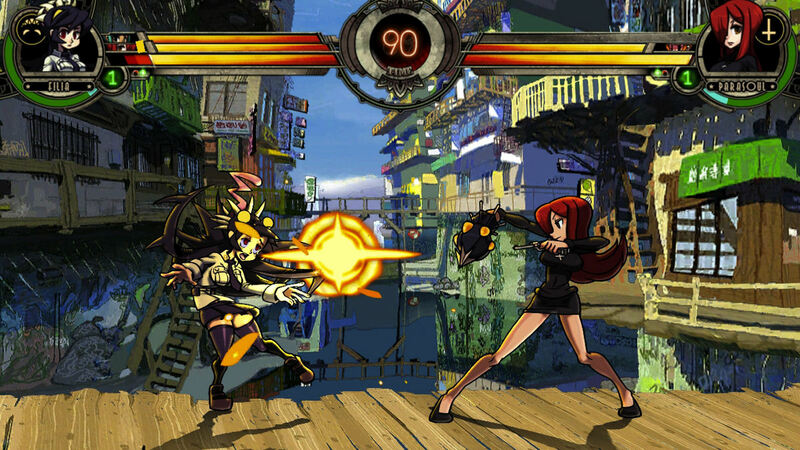 Hands-On with the Skullgirls. Hur, Hur, Hur. As soon as you jump into a match in Skullgirls, you can tell it has been delicately handled by people who have an intimate knowledge of the fighting game genre. Even in its Alpha build, the game is an absolute stunner. Every single frame has been hand-drawn, with each character clocking in a whopping 1200-1500 frames, making the action some of the smoothest I have ever seen. The art-deco style of the whole game is beautiful, with real-time lighting effects and dynamic backgrounds, the levels are vibrant with some neat little nods to popular culture. Take my current favourite character, Peacock, who is inspired by classic Disney cartoons. She carries all the slapstick equipment you’d expect, a “Bang” joke gun and can also drop an anvil onto her opponent. The amount of customisation available to the player can be seen everywhere, starting with the character screen. Players can choose to fight with up to 3 fighters, 1 being super-powered, and 3 giving you greater tactical options with tag assists and combos. After you choose each character, you can customise the inputs for their assists. What this means is that you can decide the specific move your characters will do when they assist you. This is so simple and yet such a game changer. When selecting a characters costume, you can preview which colours you will get based on which button you press, another simple yet great addition. 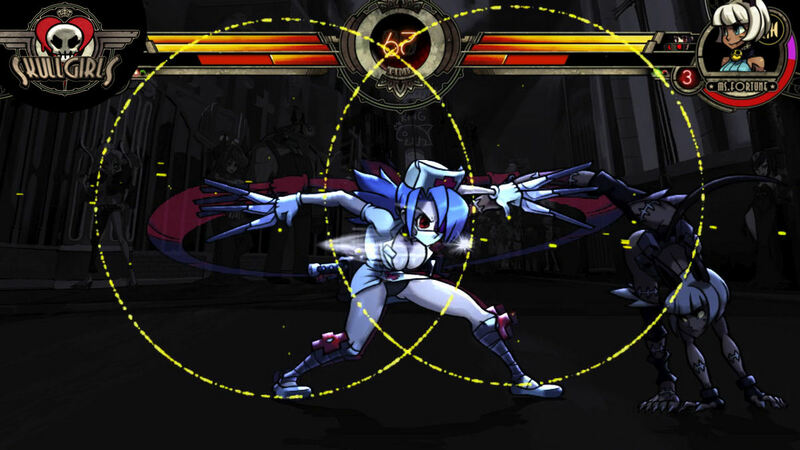 There are so many ideas in Skullgirls which are so simple, but yet have never been properly realised in a fighting game before. Each of these little tweaks to the classic fighting game genre has the potential to re-write the rulebook, and makes it a much more welcoming entry for newcomers. 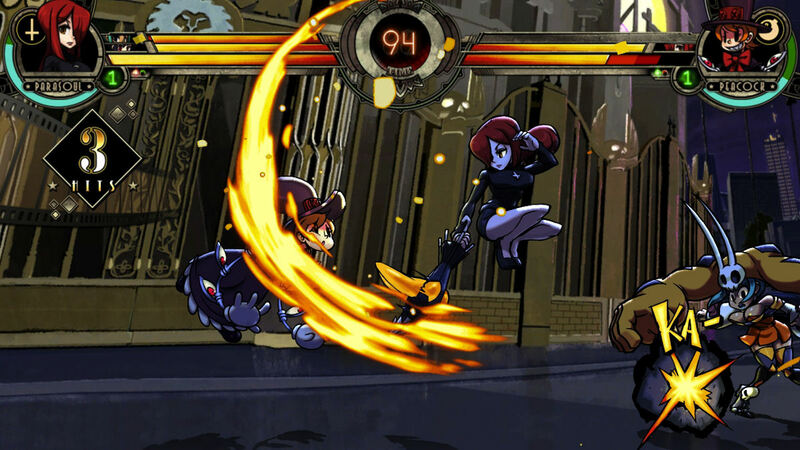 For the fighting experts out there, Skullgirls prevents you from exploiting infinite combos, allowing the opponent to escape with a simple button press after a certain amount of damage. This stops more advanced players using cheap tactics against newcomers and means you must vary your combos in order to maintain the move. For all those shoryuken-spammers out there, up your game. There are some great little mechanics that make pulling off moves far easier than in other games. Anyone who has played a fighting game that requires you to rotate the stick to pull off a special knows how often you can accidentally jump. 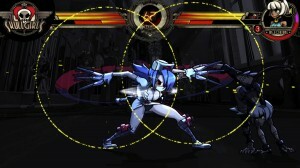 In Skullgirls, the game knows when you are doing a certain move and will prevent your character from jumping at the top of the 360 degree motion (mind=blown). When playing the game, all of these ideas are felt immediately. Depending on how many characters you choose to fight with, the game can feel like a mix between Street Fighter III: Third Strike and Marvel vs Capcom. The game uses the same light, medium, heavy punch and kick inputs as in the Street Fighter series, combined with the combo mechanics of MvC3, making games both fast and frantic as well as strategic. In my opening few matches, I had no idea how to pull off any combos, but soon I found myself pulling off spectacular super combos, combining them with classic cancels into chains and tag combos. The game feels familiar and unique in all the right places, the moves feel exactly as they should, borrowing from the genre’s rich history, while making itself a totally unique experience with its art style and new mechanics. Fans of fighters will quickly find themselves adapting to the game’s style, and newcomers will quickly pick up the pace by playing through the well thought-out tutorials. I was playing an alpha build, and it already feels superb. 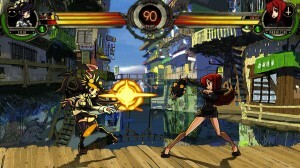 I can’t wait for Skullgirls to hit the Xbox Live Marketplace and PSN Store early next year. Sports fan, videogame fanatic, writer.